- Coupling of load to the source so as to maximum power delivered to the load. 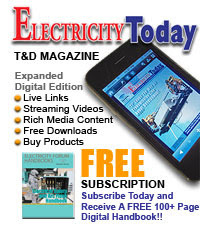 This application exploits the impedance transforming property of the transformer. 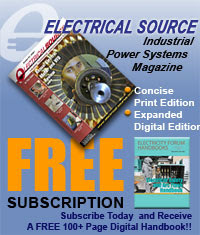 Under condition of impedance matching the over-all efficiency of the system is as low as 50%. But in electronic circuit applications the performance criterion is the maximum power unlike the maximum efficiency in power system applications. Such transformers are known as output transformers while in audio applications these are known as audio-transformers. - Providing a path for dc bias current through the primary while keeping it out of the secondary circuit. An important requirement of these transformers is that the amplitude voltage gain (ratio of outptu/input voltage amplitude) should remain input constant over the range of frequencies (bandwidth) of the signal. Further, it is desirable that the phase shift of output signal from the input signal over the signal bandwidth be small. We shall now investigate the gain and phase frequency characteristics of the transformer. This would of course include the effect of the output impedance (resistance) of the electronic circuit output stage. In these characteristics as the frequency range is quite large the frequency scale used is logarithmic. 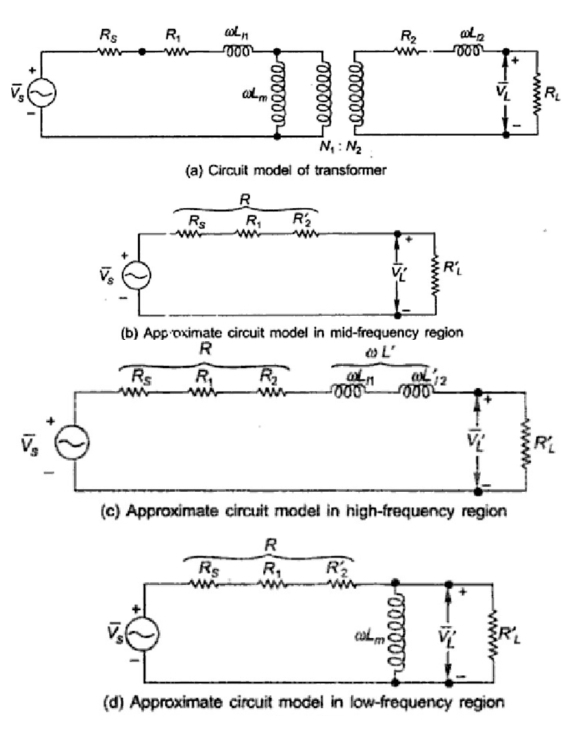 The circuit model of a transformer fed from a source of finite output resistance is drawn in the Fig. 1(a) where the transformer core loss is ignored and leakage and magnetizing effects are shown in their frequency dependent from i.e., X = ω L. It may be observed here that Lm (magnetizing inductance) = L11 (self inductance of the primary coil). Amplitude and phase response can be divided into three regions where in the response calculations are simplified by making suitable approximations as below. In this region the series inductances must be taken into account but the shunt inductance is an effective open circuit yielding the approximate equivalent circuit of Fig. 3(c). Amplitude and phase angle as function of frequency are derived below. As per Eq 3 the gains falls with frequency acquiring a valve of A0 /√2 at ω/ωH = 1 and a phase angle of ∟-45o. This indeed is the half power frequency (ωH ). In this region the series effect of leakage inductance is of no consequence but the low reactance (ωLm)shunting effect must be accounted for giving the approximate equivalent circuit of Fig. 1(d). Amplitude and phase angle of frequency response is derived below. Again the lower corner frequency is the half power frequency. The complete amplitude and phase response of the transformer (with source) on log frequency scale are plotted in Fig. 2. At high frequencies the interturn and other stray capacitances of the transformer winding begin to play a role. In fact the capacitance-inductance combination causes parallel resonance effect on account of which an amplitude peak shows up in the high-frequency region of the frequency response. No reasonably accurate modeling of these effects is possible and best results are obtained experimentally. 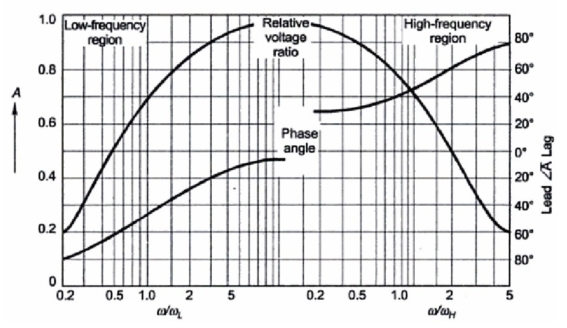 The frequency response of Fig. 2 gives a general guidance as to its nature.